You can't say you have enjoyed or experienced Texas until you have spent at least 2 hours or more on the beautiful, cool, and clear Guadalupe River. 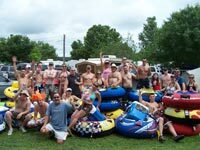 It doesn't get much better than toobing, kayaking, or rafting down the Guadalupe River with 1000's of your new found friends, on a hot day, with a tube full of cool beverages. And then after some good times rafting the river, you need to get ready for a good time rocking and rolling to great music. You have lots of choices on where to stay, what part of the Guadalupe to tube on, and where to party. 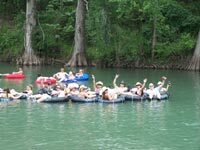 Our choice is typically the stretch of the river from Canyon Lake to Gruene because of the variety of accommodations, number of river outfitters, and fun nightlife. 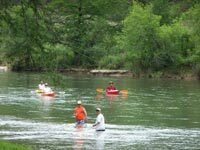 To get a perspective of this portion of the Guadalupe River and see some choices, take a look at Texas Outside's Guadalupe River Map. We will usually choose where to stay based on who has the best live music on Friday or Saturday night. 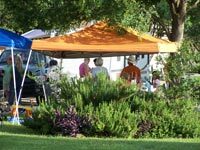 For example, if Gruene Hall has someone playing we really love, then we will stay in Gruene at either or Antoinette's Cottage and rent a tube from Rockin' R or Gruene River Raft just down the block from Gruene Hall. 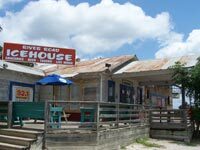 The advantage of staying in Gruene is that you can park the car and walk to good music, good toobing, and good food (Gruene River Grill). Here is a map of Gruene where you can click on each of the icons on the map to visit their website to learn more. 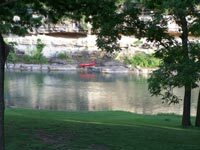 The other option and Texas Outside's Favorite is to raft/tube the section of the Guadalupe River just below the Canyon Lake Dam. 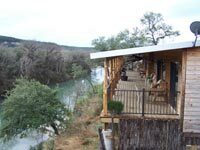 Hideout on the Horseshoe "takes roughing it" out of staying in the Guadalupe River area - they have some outstanding accommodations on a bluff overlooking the river and the surrounding hill country. Another great choice for cabins, tent camping, or RVs is Rio Raft. They have some good sites and cabins along the banks of the river and a complete rental service (tubes, rafts, kayaks) and shuttle service - they'll take you up river and you can float right back to your cabin or campsite. Then you can walk to Jazzy's on the River for some fantastic BBQ. Here is a review of Rio Raft. There are plenty of tube, raft, and kayak rentals in the area - most of which have shuttle services and trips of various lengths. 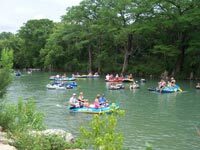 The Guadalupe River is very popular during the summer months so be prepared for lots of fellow tubers out to have a good time. You need to also check with the outfitter about the alcohol rules for the stretch of water you plan to tube. Do not bring glass and make sure you pick up your trash - keep the river clean. Be aware that in several spots on the river you will find river cops in the middle of the river looking for glass, DWT's (drunk while toobing), littering, and underage drinking. 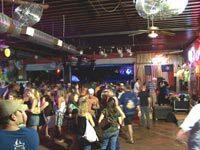 After toobing, you need to contiue Rockin' & Rollin" to some live music at River Road Ice House - a great venue with fun crowds and some of the best Texas bands around. 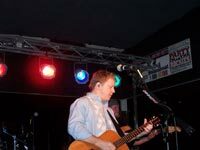 River Road Ice is a very fun bar, with an outdoor stage, picnic tables on the grass, lively and friendly crowd, and excellent bands like Cory Morrow, Roger Creager, Honeybrown, Kevin Deal, Jack Ingram, and Jason Borland just to mention a few names.